One of the things keeping some people from picking up the Samsung Galaxy Note 2 is that they feel that at 5.5 inches, it’s too big to be a phone and too small to be a tablet. What if we told you that you could have the best of both worlds? A premium smartphone that’s below the 5-inch threshold but at the same time can give you the functionality of a full-sized 10-inch tablet? How is this technological sorcery possible? Easy — through the Asus Padfone 2. Earlier today in Taiwan, Asus unveiled the sequel to their transforming smartphone — the Asus Padfone 2. 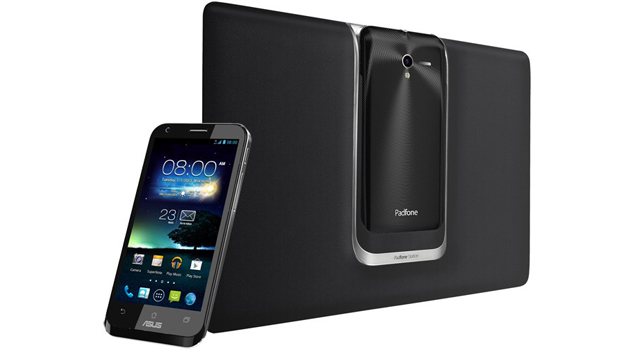 Users have the option of just buying the impressive Asus Padfone 2 device or bundling it with the Padfone Station. Getting the optional dock would allow the device to transform into a full-sized tablet for those times that a smartphone-sized screen just wont cut it. So why should the Asus Padfone 2 be worthy of consideration over the Samsung Galaxy Note 2 or the LG Optimus G? The device will be sporting a 4.7-inch 720p IPS display, a monstrous Qualcomm Snapdragon S4 quad-core processor supported by 2 GB RAM and will come in 32 GB and 64 GB variants. Shutterbugs will also be happy to know that the device packs an impressive 13 MP shooter. What about its OS? It will come with Android 4.0 Ice Cream Sandwich, with a promise from Asus that it will be upgraded to Jelly Bean in the future. With specs like that, the device is easily in the same league as the incredible LG Optimus G. But what about the Samsung Galaxy Note 2? That’s where the Padfone Station comes in. If 5.5-inches isn’t big enough for the times you do want to use your phone as a tablet, all you have to do is slip the device into the Padfone Station and you get a seamless transition from phone to tablet. What’s more, the dock to the Asus Padfone 2 has also been improved — you now won’t need a door to secure your device and the entire thing weighs 649 grams, with the Asus Padfone 2 docked, making the whole package very light and easy to transport. Interested? Well it’s not going to be cheap but the good news is that the Asus Padfone 2 and the Padfone Station is priced pretty reasonably for what you’re getting. European sites have pegged the combo at €799 ($1039) and €899 ($1169) for the 32 GB and 64 GB versions respectively. What do you think? Is the Asus Padfone 2 a worthy alternative to the Samsung Galaxy Note 2 and the LG Optimus G? Sound off in the comments below!